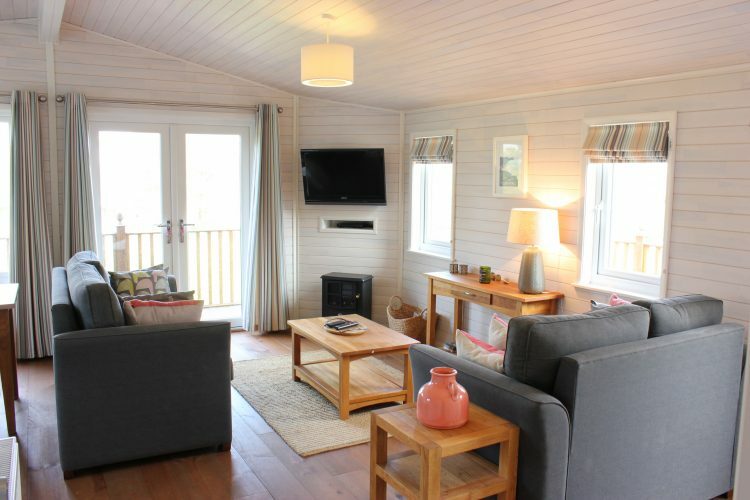 2 bedroom lodge to let, the Walnut Tree | Hentervene Holiday Park. When we buy our lodges to let, we want to offer first class accommodation for our customers. Our lodges have been beautifully designed and furnished to evoke the feeling of a coastal retreat, which they do very nicely. This 2 bedroom lodge to let is no exception. The Walnut Tree lodge is identical to our Maple lodge, but it does not have a hot tub. The living area is open plan, spacious and comfortable, wall mounted HDTV, DVD, books and games. Something to keep everyone entertained. We provide everything you need for a self catering holiday. The kitchen is fully integrated with dishwasher, full sized oven and hob, Fridge freezer, and all the utensils you could possibly need. This fabulous 2 bedroom lodge to let has a double room and a twin room. The spacious family bathroom has a double ended bath and shower. We are open all year. The wooden lodge is superbly well insulated and has central heating so is perfect for a holiday whenever you wish, therefore you can come and explore Cornwall in the summer months or its more dramatic Winter months. We include heating and electricity in the price. We also provide bedding and towels. There is space alongside for parking. To make the most of those al fresco moments there are French doors leading to a generous decking area with table and chairs and parasol. There is a private barbeque area with barbeque provided and wonderful views over the cornish countryside. This 2 bedroom lodge to let is the only accommodation at Hentervene that does allow for dog visitors. The balcony has a gate, so if you do bring your beloved dog, they can enjoy the outdoors safely without the fear of them wandering off. Please bring their bedding with you. Maximum 2 dogs. Are you bringing a baby/toddler? We know what to is like trying to organise everything for the little ones, so let us help. Please request our baby friendly holiday equipment when booking, there is no charge. A good site for a family holiday.